The publication of a new novel by Cesar Aira in English is now a commonplace event (two this year alone), but his first appearance in the language occurred as recently as 1998 thanks to Serpent’s Tail (and translator Nick Caistor), an imprint that was also introducing UK readers to other South American writers such as Juan Carlos Onetti and Juan Jose Saer. That novel, The Hare, is atypical of what has been published since: at a whopping 248 pages it is much longer than the slim volumes we have come to expect, and it is also much more conventional in its structure, taking the idea of resolution – so often absent from Aira’s work – to comic extremes. The story, however, will not be unfamiliar to those who have read Portrait of a Landscape Painter as it is also set in the nineteenth century and concerns the journey of a European explorer across the pampas of Argentina. The explorer is an English naturalist, Clarke, who sets off in search of the titular Legibrerian Hare accompanied by a local guide, Gauna, and a young painter, Carlos Prior. They spend some time with the Mapuche tribe but when their chief, Cafulcura, goes missing, they are asked to help discover what has happened to him while still ostensibly searching for the hare. Both of Clarke’s companions are also seeking something: Prior has fallen in love with a Mapuche girl – “Ynuy has run away and I propose to set off in pursuit” – and Gauna is searching for a long lost sister. The hare, therefore, comes to symbolise an elusive goal (or, indeed, a narrative MacGuffin). (With nothing being what it seems, it will not surprise you to learn that twins are important in Mapuche mythology). 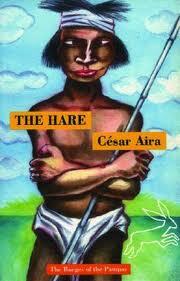 The hare, then, is little more than an excuse for the trio’s picaresque journey across the pampas. Slowly the three of them bound, perhaps initially united by the extraordinary coincidence that they are all adopted. They share stories; Clarke talks of the only woman he has loved who he lost many years ago in Argentina; Gauna reveals his search for a sister he believes possesses a valuable family heirloom. They encounter other tribes, one of which lives underground, visit the Mapuche’s great enemies, the Voroga, and take part in a mock battle. 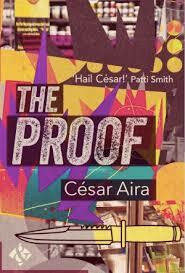 Despite being superficially a more conventional novel, Aira’s cavalier attitude to the construction of fiction is evident. In the first chapter he paints an interesting portrait of an Argentinian leader, the Restorer of the Laws, who does not appear again. Characters’ motivations are frequently oblique or opaque. And, as I mentioned earlier, the novel’s conclusion would make Charles Dickens blush. But with this comes Aira’s charm, that sense of the story moving forward, much like the travellers, regardless, never knowing, or caring, what comes next. You are currently browsing the archives for the Cesar Aira category.